We had our first visitors last week. My parents made the brave trek down to Houston. I say brave because just before they arrived, we were hovering around 2-5 C in the morning in Houston. It was cold. I had to break out my pants. Thank goodness Houston redeemed its hot, humid self, so my parents could relish instead in highs of 28C, feels like 38C weather! Rob and I have become accustomed to Houston’s weather, positively smitten by the nice weather. Instead, my parents melted under their jeans. I understand. I was there. Except in July, it was 38C, feels like 48C! We had a hard time recommending tourist things in Houston, so instead, we treated them to a typical week in the life of Houston-bound Rob-and-Janet. On the weekend, we started it off by buying cheap produce at our favourite fruit and vegetable wholesaler. I usually beeline it to the stands with the cheaper produce, but I think my Dad had fun haggling his way to a $7 case of 24 Ataulfo mangoes (they couldn’t go any lower right now, they explained, since it isn’t high season). Next up, was the Mexican bakery across the street where we picked up the highly coveted tres leches cakes*, fresh tortillas, and other Mexican baked goods. My friend has been on a quest to find the best tres leches cake in Houston and this is his pick. My parents never knew Mexican sweets were so awesome. *Note: While this tres leches cake is definitely not vegan, we have found a nice vegan tres leches cake, too. Our subsequent stop was at my favourite Trader Joe’s, where we sampled all 3 cookie butters before deciding which one to bring home. My Dad picked the smooth version. Who knew grocery shopping could be so much fun. An employee snuck in a souvenir Houston-themed Trader Joe’s bag into my Mom’s arms, congratulating her on visiting the store with us. And lastly, since we had too much fun shopping and became hungry, we decided to have an early lunch for some quick dosas. Sunday was our standard biking morning, when my Dad joined us cycling for cronuts while my Mom relaxed at home. We went out for a Mexican fusion vegan brunch but Rob treated us to his specialty later: chilla, Indian chickpea pancakes. 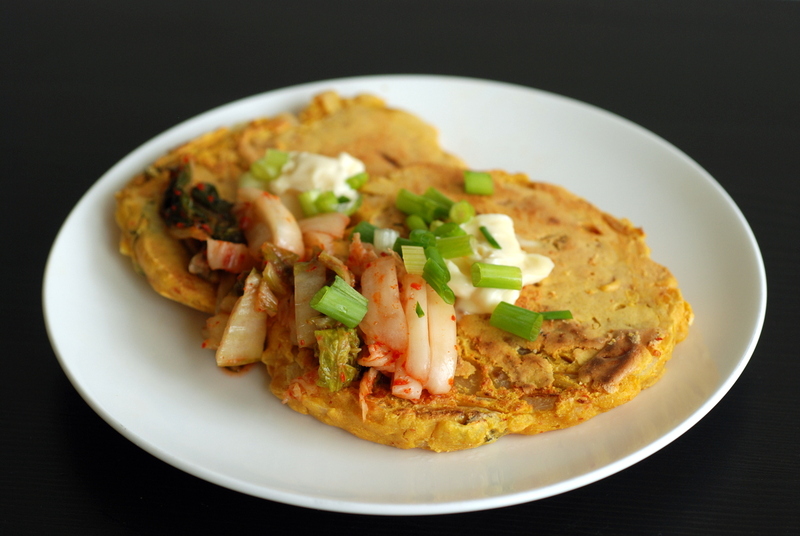 During our kimchi phase, Rob quickly figured out that kimchi worked really well in chilla. Basically it is pre-seasoned cabbage which makes it easier to add to the batter. Rob also likes to add other random vegetables, like tomatoes and spinach, but this version was just with kimchi. Easy, peasy. A dollop of mayonnaise and more kimchi as a nod to our favourite sweet potato and kimchi poutine but I ate it without it and it was still delicious. Weather prevented us from hiking Brazos Bend together on the weekend, but my parents made their own trip there together while Rob and I worked during the week. They also toured Galveston and the Johnson Space Center (NASA), the most touristy thing they experienced. This is my submission to this month’s Credit Crunch Munch. PS. The winner for Practically Raw Desserts is Ali! 1. Mix chickpea flour, onion, garlic, ginger, turmeric, and black salt together. Add in enough water to create a pancake-like batter consistency. Mix well. Stir in kimchi. 2. Heat a non-stick skillet and spray lightly with oil. Pour about half a cup of the batter in the centre with a ladle and spread slightly with the bottom of the ladle to get an even-looking round, about five inches in diameter. 3. Cook on medium heat until the sides dry up and the bottom turns richly golden-brown. 4. Flip over and cook until the other side turns golden-brown. 5. 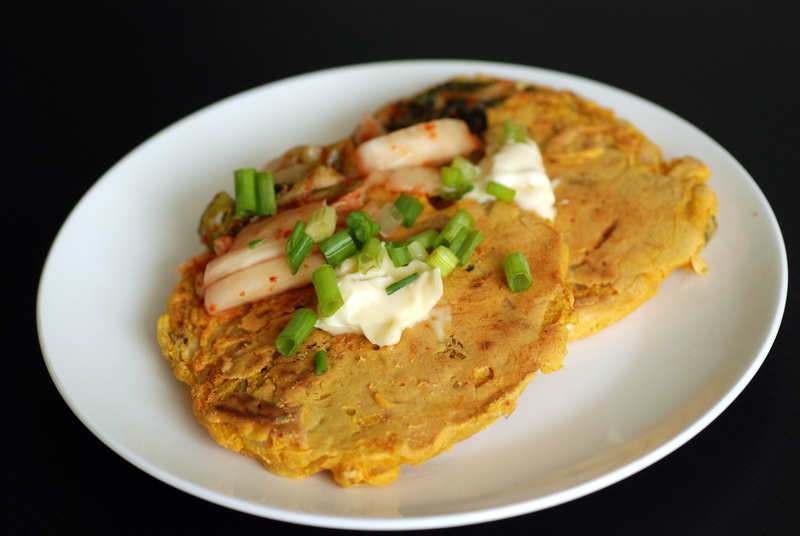 Serve, topped with mayonnaise (if desired), additional chopped kimchi and green onions. It sounds like you’ve had a great time with your parents – and it must be great seeing them in person again. It also sounds fortunate that they didn’t visit in summer 😛 These pancakes look delicious too! 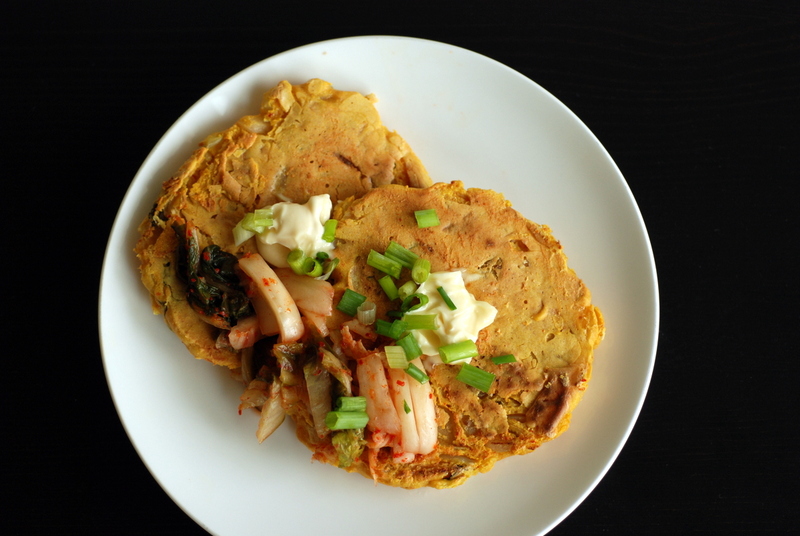 Kimchi & chickpea flour pancake are the best. I’ve been into chickpea flour lately since it’s one of the main staples in Argentina. I am planning to visit Houston, probably in the early spring, suggest few fave eats (and yes, I would want some of that kimchi tacos!) Glad you had a lovely time with your parents! 3- Ripe Cuisine (stall at the Farmer’s Market) – delicious ice cream! Sounds like your parents had an awesome time!! I’m glad the weather warmed up…they had to get a real feel for just what you guys are dealing with! Kimchi is one of my favorite things. I love it on these dosas! Looks very tasty! I always mean to experiment with chickpea pancakes as I love chick peas so much. Thanks for entering to CCM. Aww that sounds like a super fun trip! Taking them to Canino’s and El Bolillo was genius! Not to mention Radical Eats for brunch! Your lucky parents 🙂 You guys eat so well! I really need to make these chickpea flour pancakes soon to use up my GIANT bag of chickpea flour! !